It seems like light years ago that the last out was made in the World Series, and those dreaded Yankees put another feather in their cap in their new ballpark, to boot! As we flipped the calendar to November, then December, then January, then February, and finally March, blanket upon blanket of new fallen snow buried the field at Citizens Bank Park to the point where Opening Day appeared to be a pipe dream. The sun is shining in Clearwater, and the temperatures here in Philly are warming to the point where we can think about baseball again. How ironic it is that the first real test of Spring for the Phils would be against those Yankees. Can't we put them in our rearview mirror for once? I am beginning to feel like the Red Sox before our old pals, Schilling and Francona banished the Bambino's Curse. Was that really six years ago? New third sacker, but familiar old face, Placido Polanco, had a rocky start to his new position, but we can't panic after one game. Charlie says he'll be fine. On the other hand, Roy Halladay was Roy Halladay. Once again it was only one game, and a couple of innings at that, but you can see why Ruben Amaro Jr. was anxious to put him in red pinstripes. Many Phillies fans are lamenting that Halladay and Cliff Lee aren't 1 and 1A in the rotation. It would have been great, and it would have been the "Yankee" thing to do, but when you look at the rest of the NL, you have to believe that the Phillies chances for a "three-peat" look pretty good on paper. 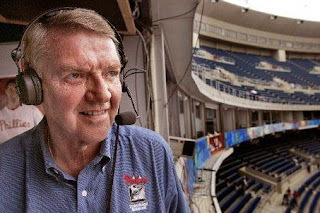 Probably the biggest downside for the Phillies this year is going into the season without Harry Kalas behind the microphone. (See my earlier blog). We will watch the rest of Spring Training closely, and hope that Cole Hamels can get his zing back, Brad Lidge can get his zang back, and Charlie Manuel can sort out the bench and the bullpen. Let's shoot for the Yankees one more time! See ya' later. Don't automatically assume that you'll be playing the "Bronx Steroid bums" this year in the World Series. The Rays probably will come back for some revenge. By the way, has anyone seen Steinbrenner lately? Just droolin' away after years of steroid abuse! You could be right. The Yankees could take a step back. They did lose a couple players, although Johnny Damon was starting to become a little bit of a liability. As far as the Rays go, they were impressive in '08, and they have improved over last year. It wouldn't surprise me.